Just before Christmas last year one of my cousins got married - it was actually a surprise wedding as we had all been invited to their engagement party, which turned into their wedding. This is the card I made for the happy couple. As I was making the card earlier in the day, I suspected that the party may be more than just an engagement party, so I made the card as a generic "Congratulations" card that would cover engagement and wedding. I started by cutting a heart shaped card from white cardstock and then added strips of patterned paper from the Kaisercraft After Five Collection paper pad. I trimmed the end of each after I stuck them down so they matched the heart outline perfectly. 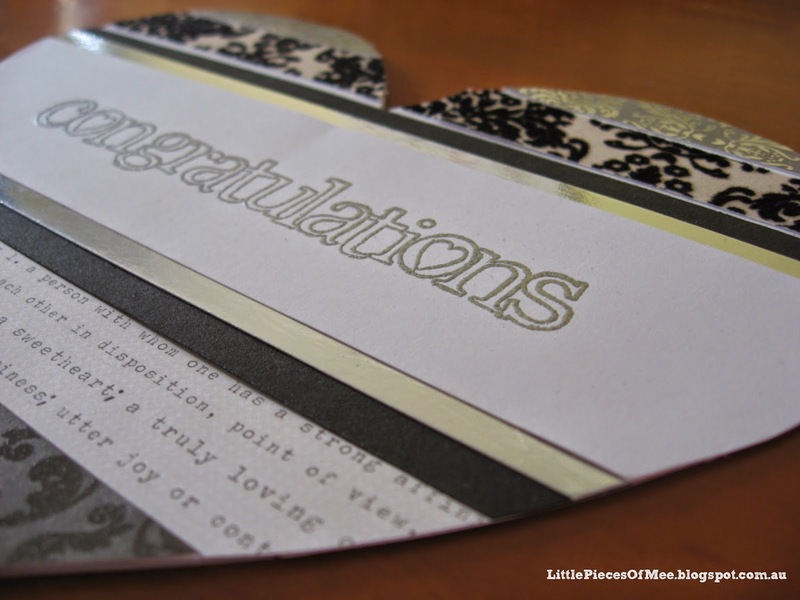 The Congratulations stamp is from The Kaisercraft "Baby" stamp set, and I embossed it with silver embossing powder. Hi Nicole. I found your blog via your mother's blog as you are taking part in the Creative Blog Hop next Monday :) It is nice to see your work! The card you made was perfect for the occasion. Cleverly done! Thank you for being willing to participate in the Creative Blog Hop.